To enjoy your spa safely, you must not neglect the choice of your filters, which guarantee crystal clear water and quality filtration. Essential for keeping your water clean, they catch particles up to 20-30 µm (1 micron = 0.001 mm) and retain them in the folds of the fabric until it is rinsed. Many filter manufacturers have created their own filter cartridge references for the most common models sold on the market (for example PWW50, PRB50 or PRB25 filters). If you are fully satisfied with your filter cartridge and you find its reference on our site, tubs.fr advises you to continue to buy the same brand. You are a little lost between the brands and their ranges with often marked price differences? We offer many filter cartridges on our site, all of excellent quality, but with different characteristics and technologies. We explain everything to help you find your way around. Proline and Darlly filters are made with Reemay fabric, made of reinforced synthetic fibers, specially designed for the pool and spa industry, and chemical resistant. This fabric uses continuous filaments so that it does not fray and tear. The filters have a good dirt holding capacity, and can operate for a long time between each wash. The original brand for most spa filters, Pleatco has been manufacturing filters in the United States for over 40 years. They use a spun-bonded polyester fabric that is "bonded point", i.e. with links between the fibres at regular intervals. This technology gives a small cell texture to the filter surface, and allows more water to pass while catching more particles, and especially finer particles than other filtration fabrics. This fabric contains more fibres per unit area than standard filters, and allows easier rinsing. Plebiscited by the tubs.fr team, Pleatco cartridges perfectly replace all your filter cartridges, especially those of the Unicel brand. 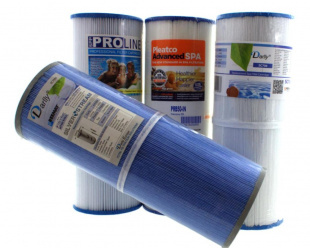 As hot water is a breeding ground for bacteria growth and proliferation, the filter cartridge brands offer for some of their references a fabric with a continuous action against microbes: the anti-microbial series from Pleatco, and Microban from Proline and Darlly. It is an anti-bacterial material diffused into the core of the filter material during the manufacturing process, which continuously prevents the proliferation of bacteria on the filter surface. The fabric impregnated with the antimicrobial material therefore consists of a hygienic protection preventing the proliferation of harmful micro-organisms such as bacteria, mould and fungi that can produce stains, create odours and cause general deterioration of the filter. At Pleatco, the tips are also made of highly resistant, antimicrobial plastic. Finally, Darlly offers the Silverstream range, which, in addition to using a Microban fabric, incorporates antimicrobial prevention technology based on silver ions incorporated in the upper and lower filter tips and in the filter core. We remind you that the more you use your spa and the hotter your water is, the faster your filter will clog. It will therefore be less able to filter impurities present in the water. If you notice a weakening of the discharge flow, it is time to clean your filter. We recommend monthly tap cleaning, even more if your filters are small or if you use your spa intensively. For a degreasing of oily residues, a cleaning is recommended every three to six months by soaking your filter a few hours, or even an entire night, in a filter cleaner. If you notice a discoloration of your filter (going from white to grey and/or brown), it is high time to degrease it. With proper maintenance, your filter cartridge has a life of one to two years. If you notice a reduced dirt retention capacity, a less compact or even relaxed fabric, it is necessary to change your filter cartridge.